In its first venture from Dunedin to Gabriels Gully, Cobb & Co. reduced the time for the trip from two days to nine hours. The company was founded in Melbourne in 1854; in 1861, its proprietor, Charles Cole, arrived in Dunedin with a luxury American Concord coach, five wagons, a buggy, more than 50 horses, and a reputation for speed and reliability. One week later, the first ‘Cobb & Co Telegraphic Line of Coaches’ service began a new era in New Zealand transport. New Zealand was crying out for a public transport network. 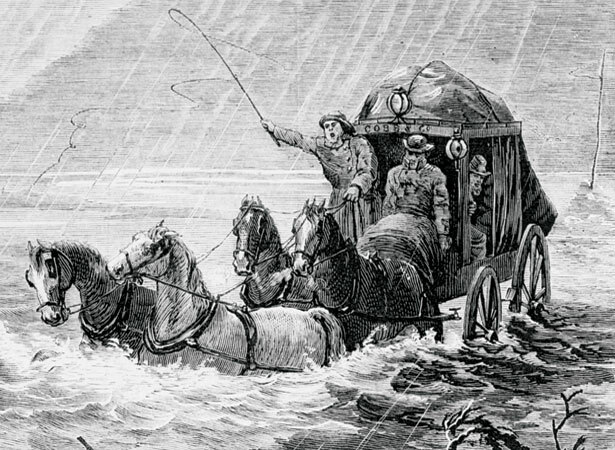 Though not the first coach service in the colony, Cobb & Co. quickly became the biggest. Coach travel was not for the faint-hearted. At the very least, passengers had to endure a queasy rocking motion and a tendency to violent swaying. On rare occasions, passengers drowned in swollen rivers or were killed by being thrown off on steep hillsides. With the development of railways from the 1870s and later the emergence of motor transport, coach travel gradually declined. Cobb & Co. ran its last stagecoach service in 1923. We have 2 biographies, 9 articles, related to First Cobb & Co. coach service runs to Otago goldfields .